I know what you mean about the mobile. I've had to make mobiles for my art classes and they are so much harder to make than it would appear! Just getting everything balanced and such. Oh, that is so gorgeous! It turned out great! 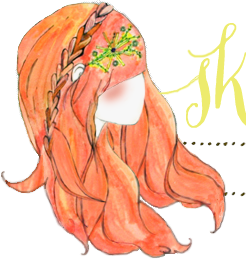 Wow, that turned out gorgeous! I've always wanted to do a jungle/safari themed nursery! amazing. that looks great. mobiles might be a challenge getting the weight even too! so adorable! i love the elephant! omg, so cute! i never thought to use your critters for a mobile! That is so well done! The animals are precious. You sure are talented. 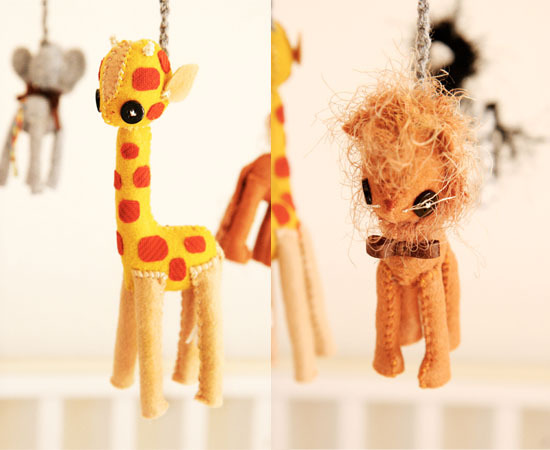 That giraffe is too precious! Well done! Oh my! This mobile is amazing! That is just beautiful! 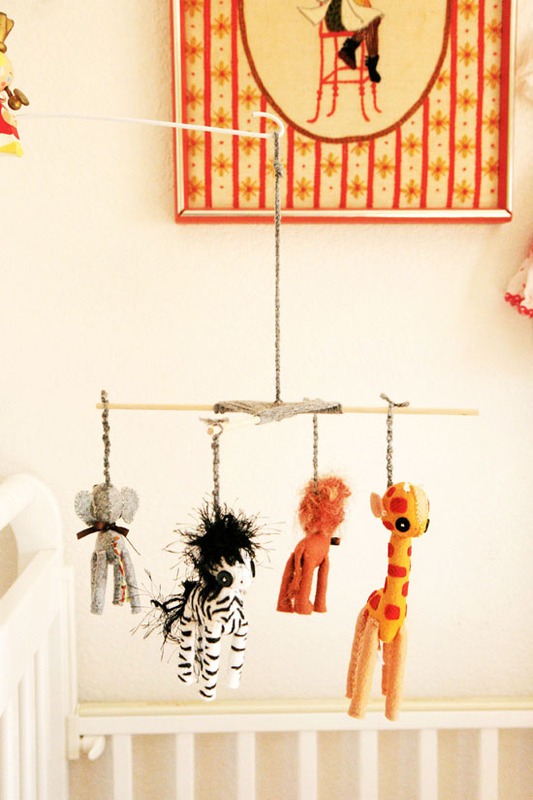 such a cute nursery addition. Eeek! Totally adorable! I love the construction you chose - it really adds to the cuteness of the animals! Well done on a brand new win, Katie! You nailed it! Ps. Posey is just the cutest! I LOVE this. I made a mobile for my friend, but I did a dream catcher one. But this would have been so freaking CUTE! I love the elephant! 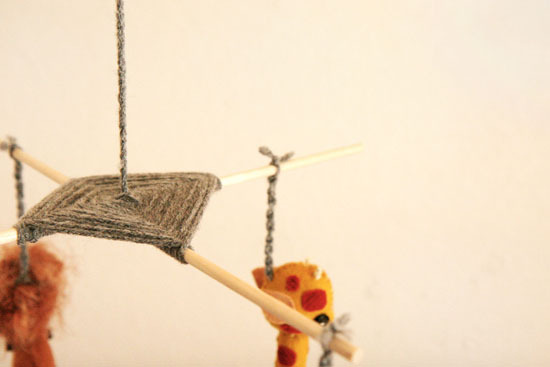 This mobile has to be the cutest thing ever! The colors are just perfect! If you do more I would love to see them! awwww i freakin' love it!! its sooo cute!! It's so darling, Katie! I can imagine something like this wasn't easily whipped up over night. It totally shows how much thought you put into it. The zebra is soooo cute! Nice work! I could never create anything like that! beautiful Katie! 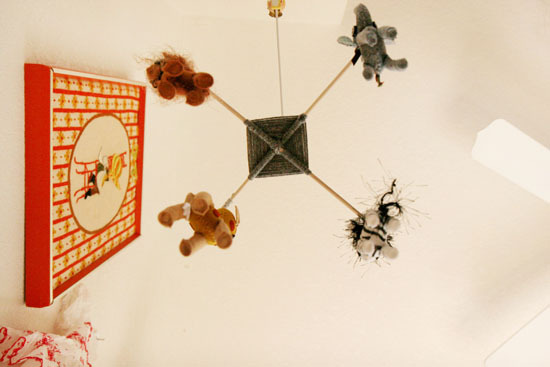 You always manage to take something as common as a baby mobile and turn it into an heirloom. This is the non-crazy Zebra? He still looks like he's tweaking out!! This is too cute! And that zebra turned out darling. Truth be told, I envy those plush-making skills of yours. Your shop was the first handmade shop that I feel in love with, and I'm still in love! It looks gorgeous! Its looks amazing! I would seriously hang this above MY bed, and I am 25! The composition of the mobile looks both cozy and professionally done at the same time- a job well done! So adorable! 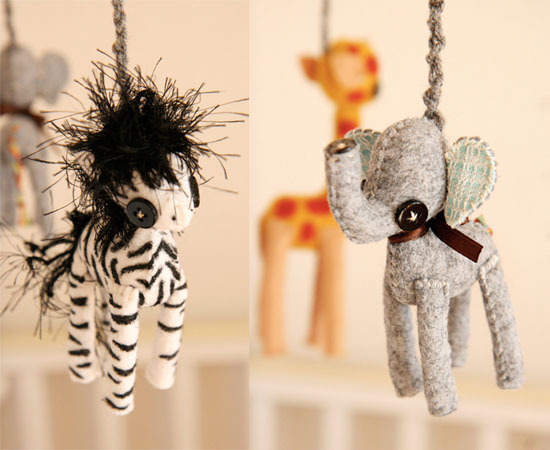 I love all the little animals, but the giraffe and elephant are my favorite! Cute!!! I want one for myself haha. Great job! That came out so great! Love! ACK!!! Too cute for words!!! I cannot wait for it to come so I can hang it up in Krew's nursery! I could not be happier with how it turned out. Thanks again Katie! so adorable! You're amazing. Love this. Oh, my goodness - I love the hair on the lion and zebra! o wow. this is incredibly adorable and DIFFERENT! love it! great job! when i have kids i am so buying this. actually i want to buy this even though i don't have a baby. That was an ingenious way to join your pieces. Super cute. Oh these are so cute! You are so talented. Amazing! This is soooo helpful! 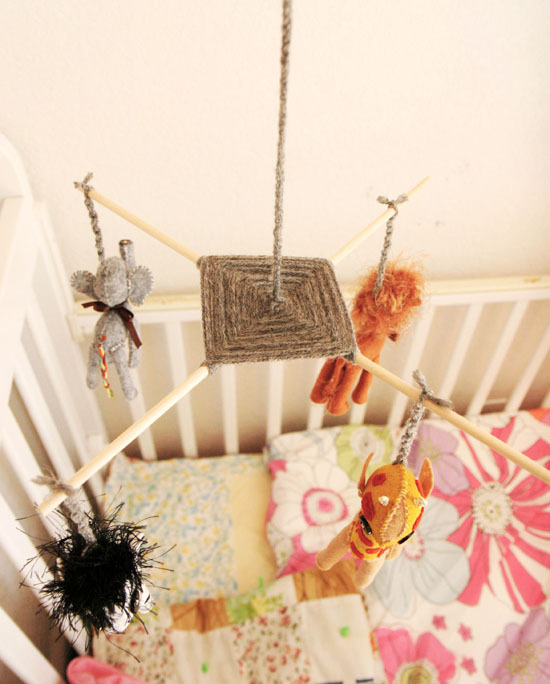 I am currently working on a baby mobile too and I didn't think about the weight thhing! I've done and undone so many times!